Every wardrobe needs a cozy, warm jumper and Saucony has you covered with their range of outerwear for lesiure or active lifestyles. 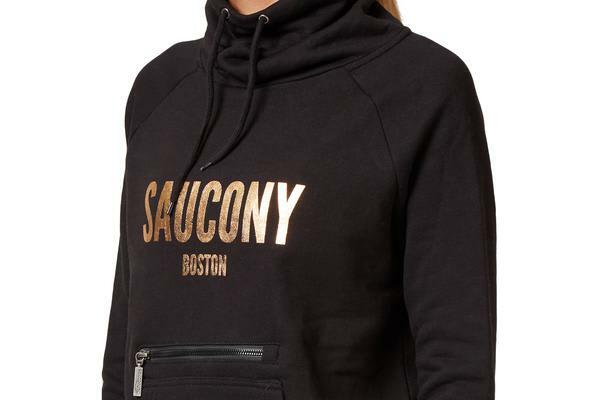 The Saucony Boston Funnel Neck Jumper features a funnel neck with a drawstring, warm fleece lining and practical kangaroo and zippered pouch pockets to keep all your essentials in. Finished with a metallic ‘Saucony Boston’ logo print just because. Pair with jeans, leggings or sweatpants, this versatile jumper is a comfortable and stylish choice for those casual days. Material: 65% Cotton, 35% Polyester.